Cook the potatoes in a large pan of boiling water for 12–15 minutes until just tender. Meanwhile, heat half the oil in a frying pan, add the onion and cook for 5 minutes until soft but not browned. Drain the potatoes and leave until cool enough to handle before cutting them in half again. 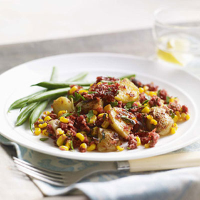 Mix the potatoes, onion, corned beef, sweetcorn, parsley, chilli sauce and seasoning together in a mixing bowl. Heat the remaining oil in a large non-stick frying pan; add the corned beef mixture and cook, stirring, over a medium heat until the mixture starts to brown and the potatoes crisp up. Preheat the grill. Pat the hash mixture into a flat-cake shape and fry the base over a high heat for a couple of minutes. Then place the pan under the grill for 3–4 minutes to brown the top. Serve with green beans. with a fried egg on top. This recipe was first published in April 2010.